29th Annual WWIB/Sew Complete "Warmth from Wisconsin" Quilts are now on Display! 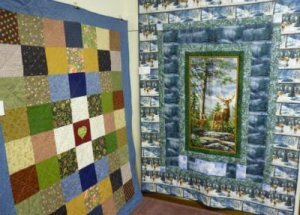 The 29th annual WWIB/Sew Complete "Warmth From Wisconsin" quilt contest quilts have now been judged and are on display. There are two categories of quilts. The small size must be at least 46" x 36" and no larger than 60" x 56". The larger size must be at least 60" x 72". Each quilt contains a "Warmth from Wisconsin" starter square from Sew Complete. The starter square must be included in the quilt top to qualify for the contest. They will be on display at Sew Complete through March 6th, before being distributed to Youth With a Mission and Apple Pregnancy Center, Inc., in Eau Claire. Youth With a Mission missionaries are currently working with the homeless population in San Antonio, TX, and Apple Pregnancy Center is working locally with new Mothers and families. 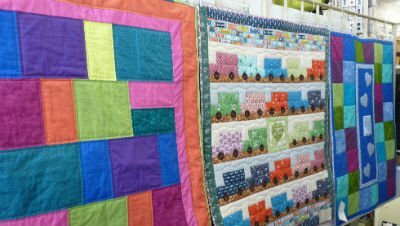 The Grand Prize is a $100 Cash Award from WWIB Radio (the judges chose the Grand prize winner from the first place quilts from the Bed quilt and Crib quilt categories). We are very grateful to all who have participated in this endeavor in the past. 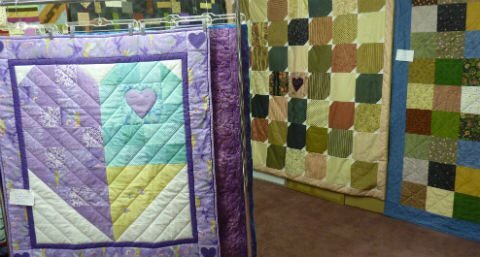 Hundreds of quilts have been given to people who really need them over the years. 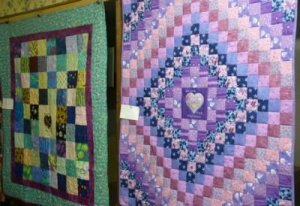 The next contest will be the 30th annual "Warmth From Wisconsin" quilt contest. Watch for details! The next Sewing Club meetings will be held Saturday, May 4, at 10 a.m.; and Tuesday, May 7, at 1 p.m. and 7 p.m. At the May meeting, we will discuss various types of battings and fills and appropriate ways to use the different weights and types of battings in many of your quilt, home dec and accessory items. We will also have some nice wardrobe projects to share. Club members, your reservation for your preferred time helps us plan for seating and refreshments. Feel free to bring your show-and-tell items, as we are all inspired by what you are doing, too. The featured Class is Serger Fun Club. This is a great place to expand your serger skills using a variety of serger techniques and oftentimes decorative thread. Everyone chooses their own project each time, and we help each person as needed with thread choices, techniques and tension.